AEG, presenter of the Amgen Tour of California professional road cycling race, has unveiled the official race jerseys for the 2012 race taking place May 13-20. 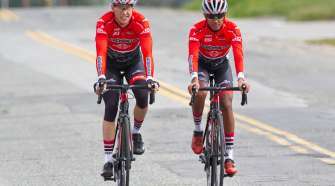 The custom race jerseys, produced by Hincapie Sportswear, official jersey supplier for the Amgen Tour of California, are awarded to the race leaders in various categories throughout the eight-day competition. Earlier this year, AEG sponsored a design contest for the 2012 Amgen Breakaway from Cancer® Most Courageous Rider Jersey. Mike Monroe from Brea, Calif. created the winning design, which prominently features the Breakaway from Cancer logo and blue and gold colors. Monroe’s design was chosen from a pool of submissions and determined by the following criteria: creativity (50 percent), use of colors and elements (25 percent), and choice of theme (25 percent). Moore’s prize package includes a trip to one Stage of the 2012 Amgen Tour of California, an Amgen Tour of California merchandise package, and the opportunity to present the official jersey to the Most Courageous Rider winner of this year’s Stage 7 which will finish in Mt. Baldy, California. The Amgen Race Leader Jersey is awarded daily to the rider with the least amount of elapsed time over the entire race to that point. Depending on each day’s results, the rider wearing the Leader Jersey can change from stage to stage. 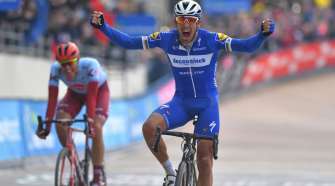 Because the overall winner is based on lowest cumulative time, it is possible for a rider to win the Amgen Race Leader Jersey without winning a daily stage. Each day, this jersey is awarded to the cyclist who best exemplifies the character of those engaged in the fight against cancer – courage, sacrifice, inspiration, determination, and perseverance. This year’s jersey was designed by a passionate Amgen Tour of California fan, Mike Monroe who won a contest for his design efforts. “As an avid cyclist, I’m well aware of how great an event the Amgen Tour of California is, and I’m blown away by being selected as the winner of the jersey design contest,” explained Monroe. “The biggest honor is to be part of such a great initiative like Breakaway from Cancer. As a reflection of California’s majestic mountains, this jersey goes to the peloton’s strongest climber. A cyclist earns this jersey by collecting points at designated King of the Mountain (KOM) locations located at the tops of mountains and hills. Only the first three cyclists to reach the top on rated climbs receive points towards this award. The Sprint Jersey is awarded to the rider that accumulates the most bonus points, which are given based on Sprint Line performances as well as finishing the stage in the top-15 places. Cyclists who specialize in bursts of power and speed, or consistently finish near the top of each stage, will have the best chance to wear this respected green jersey. Each day, all riders who are under 23 years old compete for this special recognition. The jersey will be awarded to the young rider with the least amount of elapsed time over the entire race to that point. Be on the lookout for these rising cycling stars. Following each stage, as determined by a selection panel, the daily prize for the Most Aggressive Rider will be awarded. This will be based on the participant who shows the most sporting aggression by being involved in attacks, chasing down escapes, length of time in a breakaway, etc. The 2012 Amgen Tour of California is set to cover more than 750 miles throughout California from May 13 – 20, and will feature United Cycling International (UCI) Pro, Pro Continental and Continental squads. 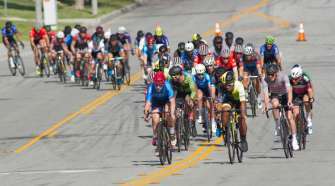 The 16 world class teams chosen to participate in the 2012 race will include Olympic hopefuls and Tour de France contenders representing more than 20 countries around the world.